You know where his allegiance lies. Captivating, intimidating artwork inspired by Star Wars: The Last Jedi. Hand-numbered limited edition of only 175 pieces! Each canvas print includes the artist's signature and comes with a certificate of authenticity! Measures 23 1/2-inches wide x 13-inches tall. 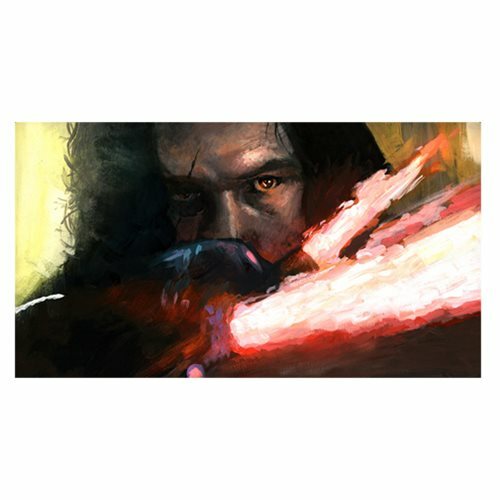 Kylo Renn and his power derived from the dark side of the Force are featured in this captivating and intimidating Star Wars Allegiance to the Dark Side by Bryan Snuffer Canvas Giclee Art Print. Allegiance to the Dark Side by Bryan Snuffer features artwork inspired by Star Wars: The Last Jedi. An unframed limited edition of only 175 hand-numbered pieces, it measures 23 1/3 inches wide x 13-inches tall. Each canvas print includes the artist's authorized signature and comes with a certificate of authenticity!